Soothing, rejuvenating and cleansing. There are hundreds of different species of helichrysum around the world, but the organic plants grown in Corsica produce the very finest Helichrysum Essential Oil, with a sweet, rich and creamy herbaceous aroma with honey, tea and spicy overtones, which is warmer and less medicinal than Helichrysum oil produced the Baltic and other regions. 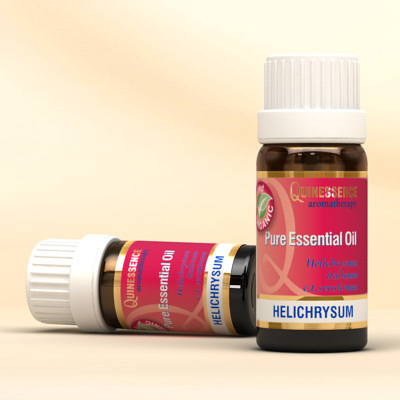 The vast range of therapeutic properties of organic Helichrysum Essential Oil is truly remarkable, and is probably due to its unique chemical composition that includes components not currently be found in other oils. This essential oil is one of the finest choices in skin care treatments for spots, pimples and acne, as well as for soothing red, irritated and sore skin. Organic Helichrysum Essential Oil is excellent for treating sport injuries and soothes all types of muscular and ligament strains, and when applied undiluted swiftly it can prevent the inflammation and bruising typically associated with these injuries. Applied post-injury it helps fade bruising in record time. The word Helichrysum is derived from the Greek word 'helios' meaning sun, and 'chrysos' which means gold and refers to the colour of the flowers. After picking and drying, the yellow flowers are able to retain their form and colour which gave rise to the common names of 'everlasting' and 'immortelle' for the plant.